If you are looking for a Bluetooth speaker to stream audio from your smart-phone then you should check out the Cambond Bluetooth Wireless speaker. This speaker comes in two colors; the blue you see here as well as a solid black speaker. Personally I liked the blue as it added some flavor to my desk! The speaker has a nice, loud sound to it. I would say it is easily triple the output of what the phone speaker outputs. It has some nice bass in the music too, depending on the type of music you listen to then this is something you probably want when listening to music. 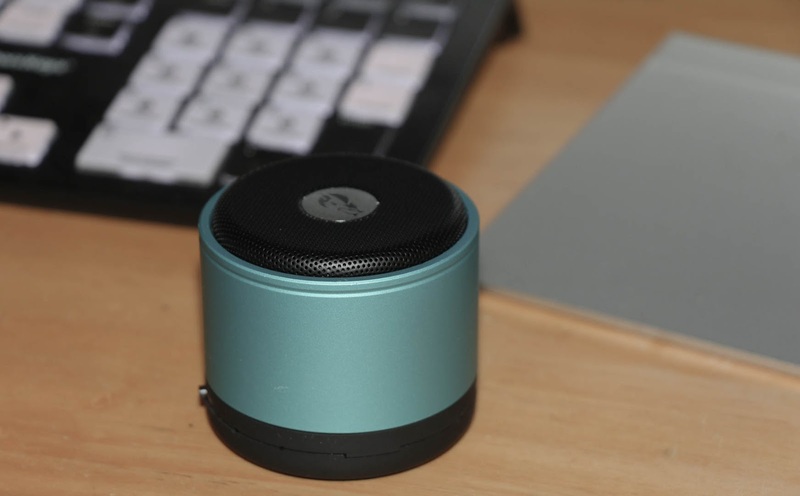 The speaker also has features such as volume control, forward/reverse to next or previous song, play and pause, as well as the ability to plug in a phone via AUX cable. It does come with both the charging cable and the AUX cable for a wired connection. You can also take calls on the speaker as well. If you bought an iPhone 7 / 7 Plus then this might be something to consider. Yes, you can use the adapter to connect the iPhone to this speaker via AUX cable. I have tested it and it works great with an iPhone 7. A speaker like this is great for both music as well as podcasts; but, you can also connect your phone to the speaker if you want to watch a video or movie on your phone but want a better or louder sound when watching.